This print illustrates an Irish dancing master plying his trade at a holiday gathering. His dress is characteristic of the profession: knee breeches, a tailcoat, walking stick and a Carolan hat. 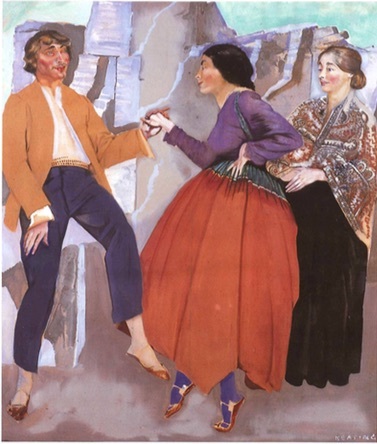 His appearance in the midst of the unruly scene signifies civility and sophistication. 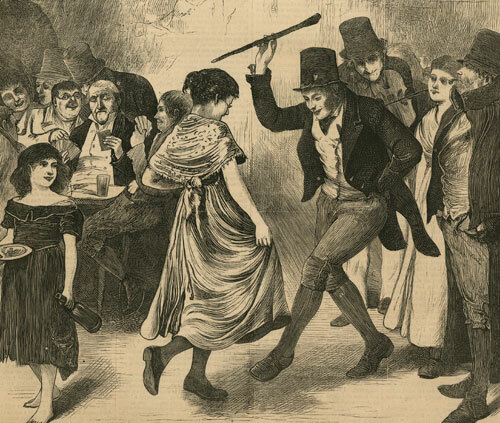 "New Year's Eve in Ireland," The Graphic (London), 15 Jan. 1870. 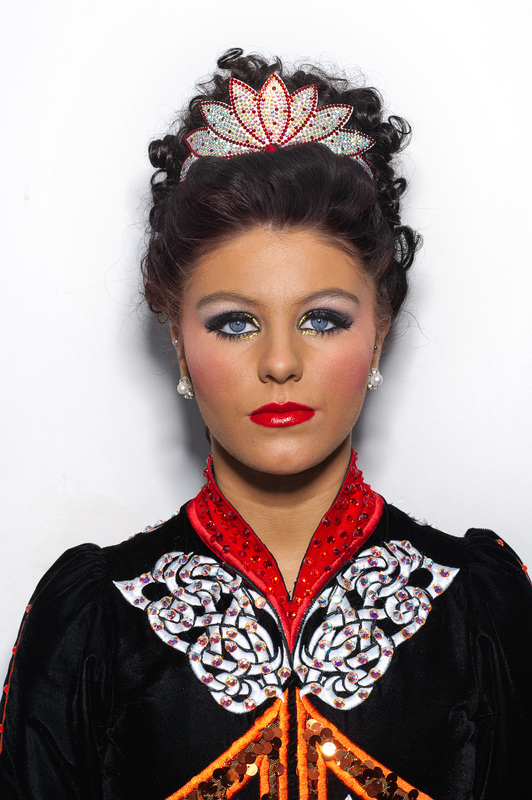 Missouri dancer Annie Stark is an Irish-American dancer with the Driscoll School. 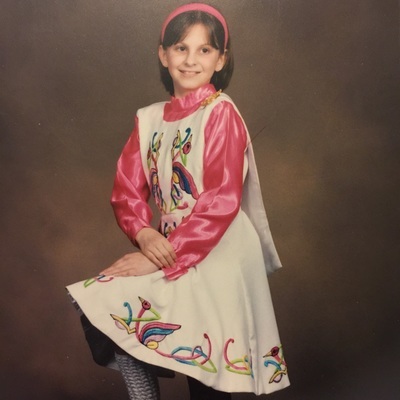 She paid tribute to her Irish dancing heritage through her solo costume by emulating the knotwork of her mother (pictured) and aunts' school costumes from Ceol Anya of Seattle, WA, USA c. 1970s. 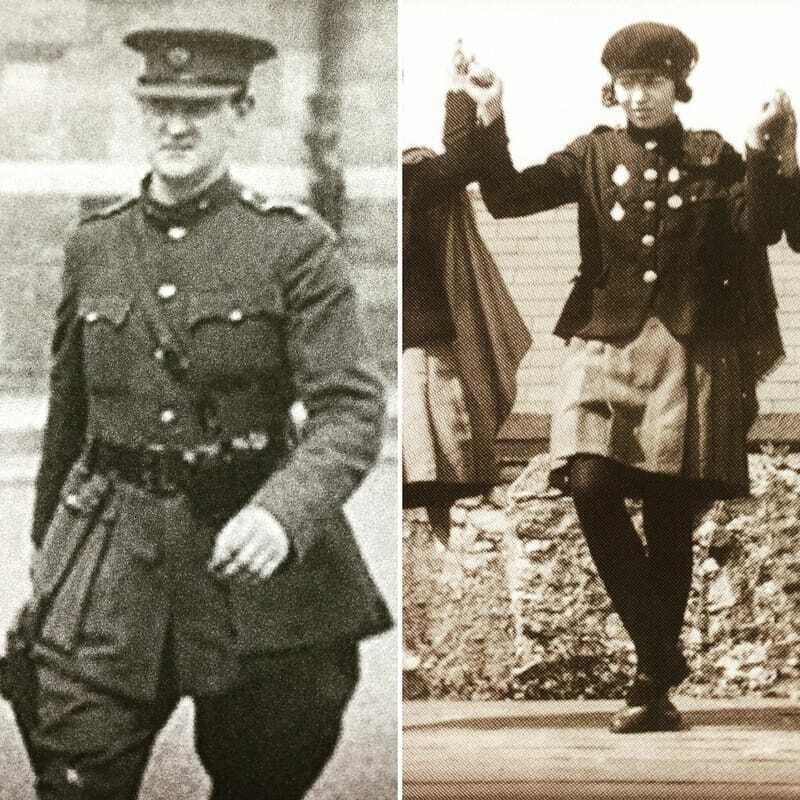 The first school costumes to emerge in the late 1920s-early 1930s bore the distinctive influence of military uniform. 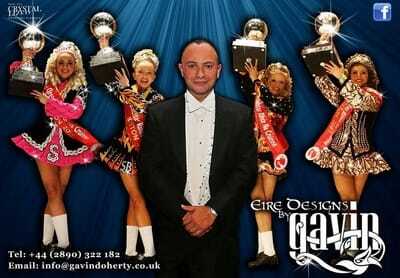 The early years of Revival style Irish dance, the dominant form with which most are familiar today, are intimately entwined with the struggle for independence and the foundation of the Free State. 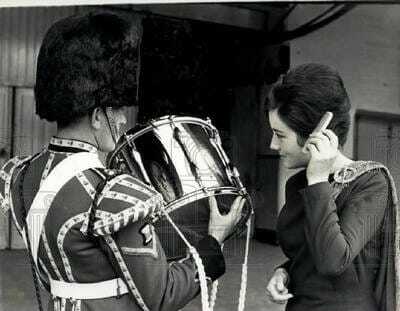 A drummer from the massed piping bands of The Royal Irish, Ulster and Inniskilling Fusiliers assists an Irish dancer from the Women's Royal Army Corp with preparations for a performance in 1964. 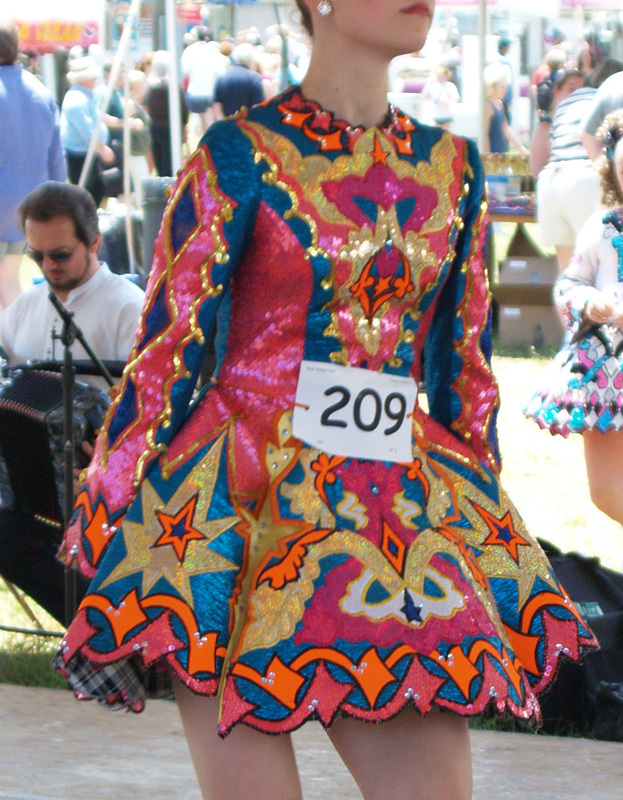 Both drummer and dancer are soldiers, however, the dancer's appearance is hyper-feminized, thereby diminishing the viewer's perception of her as a soldier. 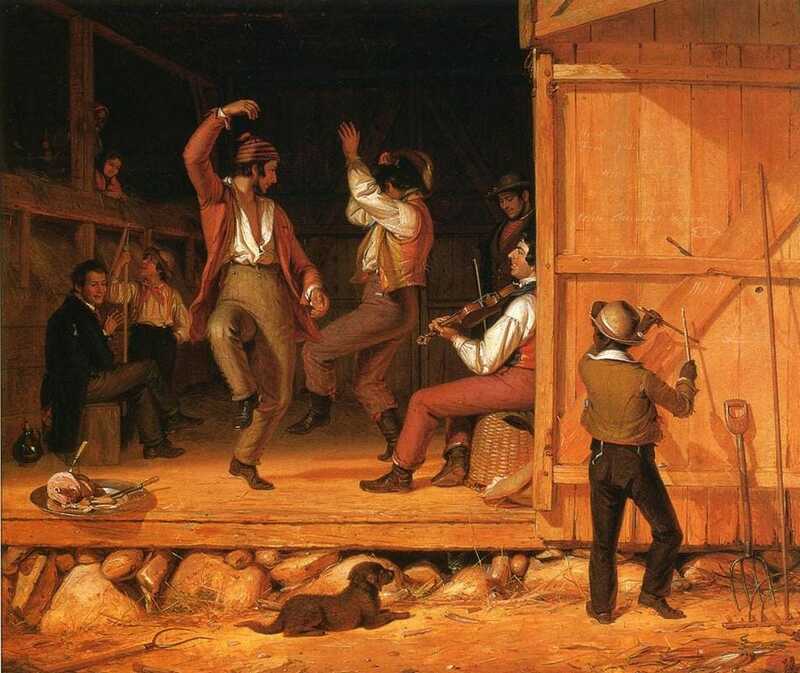 This 1845 painting, "Dance of the Haymakers," by the American painter William Sydney Mount is likely a depiction of an Irish dance in an American rural context. 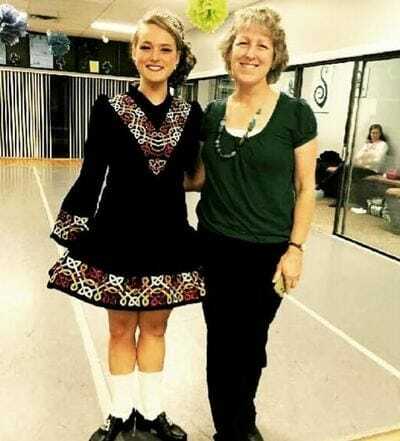 The existence of Irish dancing in America has been documented at least since the 18th century with early waves of Irish emigration from Ulster. 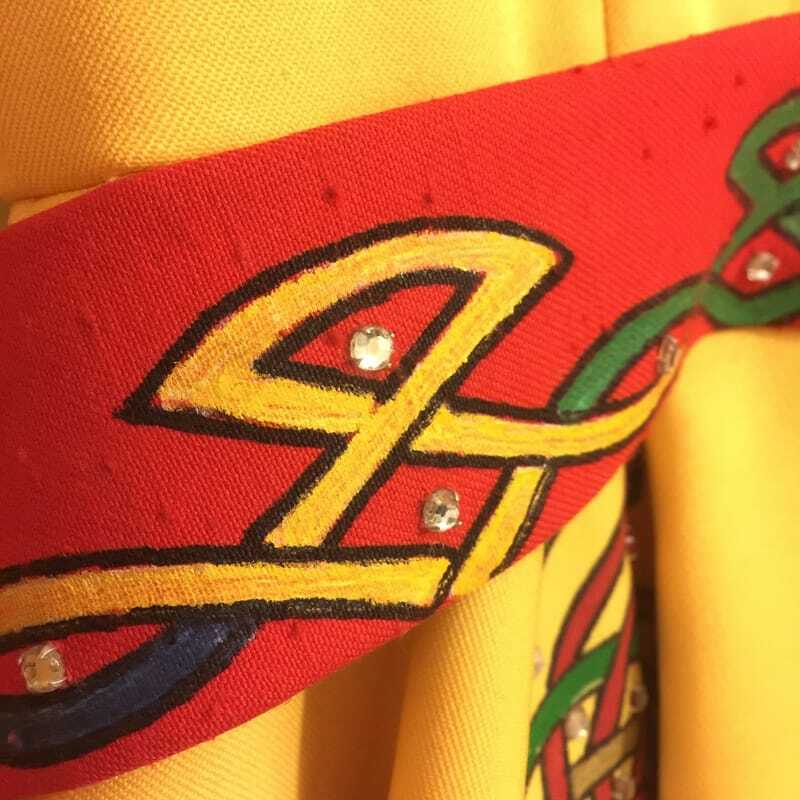 In the 1980s a trend of hand painting costumes became popular, giving dancers with less embroidery skill, or less money to purchase machine embroidered dresses, the opportunity to participate in ornately embellished costume practice. This costume was hand painted and worn to the World's c.1982 by Irish-American dancer and now photographer Kate Ronan. 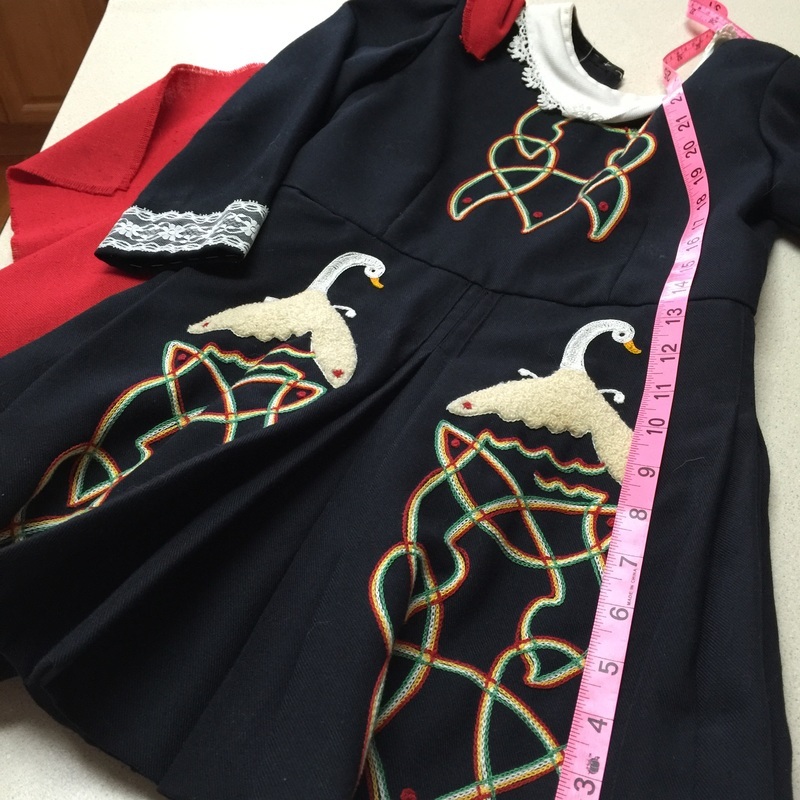 Her mother, Nora, of Ballinobeg, County Kerry, sewed the costume. This advertisement for leading costume producer Eire Designs of Belfast draws a clear association between the importance of appearance and the culture of winning in Irish dance. The rise of the "brand name" dancing costume represents a significant culture shift from rural and "homespun" to urban and cosmopolitan. 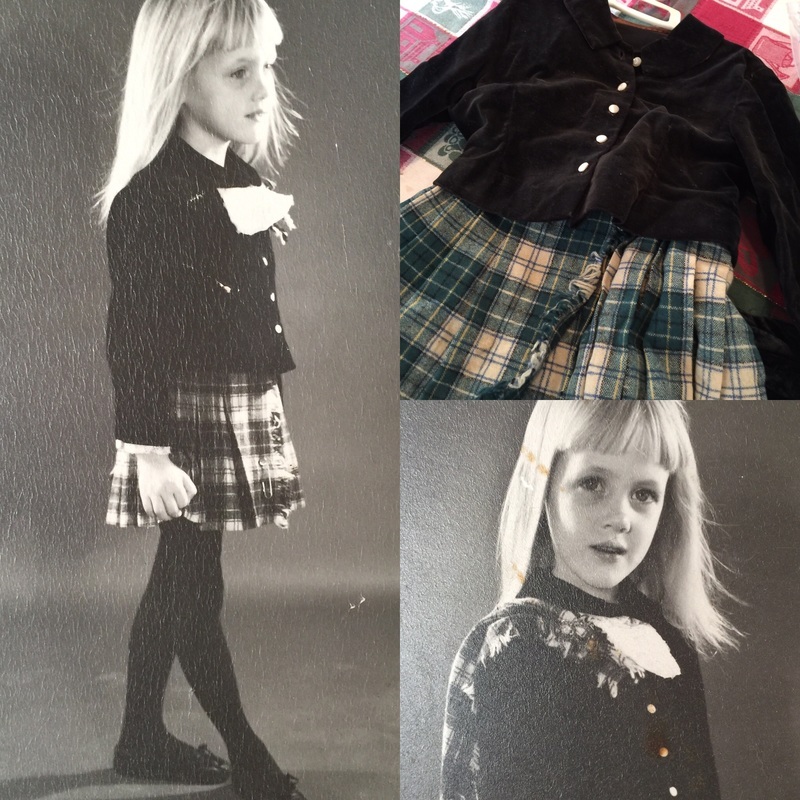 "How can we approach aspects of the past that written words do not record? How can we mobilize not just a few kinds of things that have survived from earlier times, but many, to create history?...As historians working with material things, these are among the many puzzles we face." This research project is an attempt to collect, preserve, and analyze the unique and ever-changing global culture of Irish dance through its associated material culture. These artifacts, which include photographs, newspaper articles, paintings, costumes, and other ephemera, exist in disparate public and private collections and have yet to be fully examined and understood. 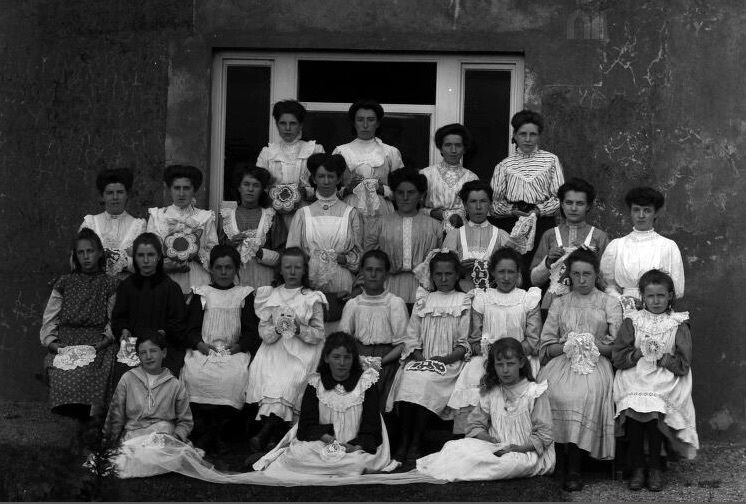 The examination of this rich cultural history reveals a story often neglected by the historian's pen: the world of girls and young women. This endeavor seeks to illuminate the "hidden lives" of women in Ireland and among the Diaspora, using the artifacts as a form of inquiry into their neglected personal histories and intimate interactions. 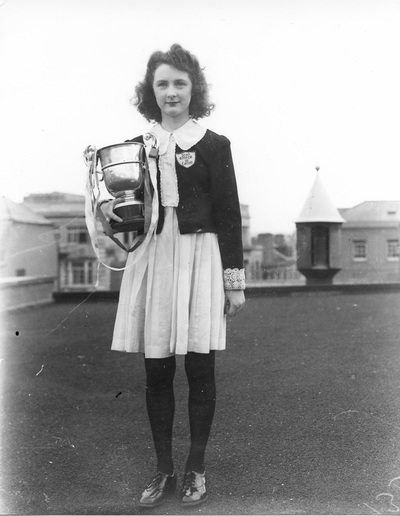 For more information about this project, or to contribute materials or personal recollections, please contact churchis@tcd.ie.